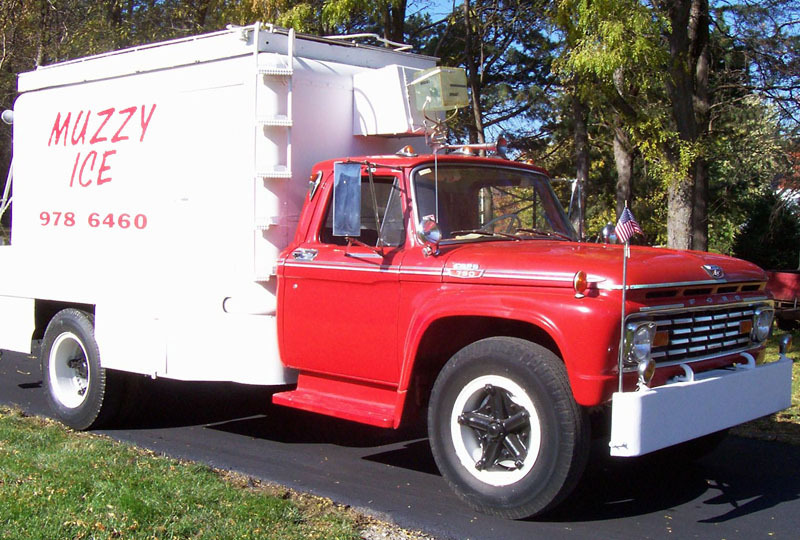 Muzzy Ice Service has been family owned and operated for over 60 years. Currently owned by Jim Cerone, Muzzy Ice Service was started by his father in the early 1940's. He started our by delivering blocks of ice to homes with ice boxes before there were electric refrigerators. After serving his country in WWII he returned home to restart his business delivering ice to bars, restaurants, and packing houses around the Omaha area. In 1952, he married and had 11 children. As a small child, Jim remembers helping his dad and brothers bag the ice. They would help cut up 300 lb blocks of ice and drop them into a big grinder. Then, they would line up with bags and catch the ice, while others would hand them off to get tied with wire ties. Then, they would stack them in the ice house. In the 1970's, Jim's dad started tinkering with the large blocks of ice. Using a chain saw and hand tools, he started making shapes of animals and then hearts and swans. When there was a wedding in the family he would always make a carving. After a few family weddings, relatives suggested he start selling them to the public. Today, Jim Cerone continues the family business of delivering quality beverage ice to the local metro area and inspires new designs of ice sculptures for all types of events. Need more info? Contact us by clicking this link! Muzzy Ice Service 1963 Delivery Truck.